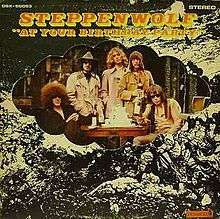 "It's Never Too Late"/"Happy Birthday"
At Your Birthday Party is the third studio album by Steppenwolf, released in 1969 (see 1969 in music) on the label ABC Dunhill Records. It was the first Steppenwolf album to feature bass player Nick St. Nicholas. Although it was less critically acclaimed than their successful first two albums, Steppenwolf and The Second, it contains a few well-known hits, such as "It's Never Too Late" and "Jupiter's Child", as well as "Rock Me," which had been featured in the 1968 film Candy. Although the band would be very successful in the early 1970s, At Your Birthday Party was to be their last top ten album and features their last top ten single. The album showcases Steppenwolf coming out of, but not yet completely abandoning, the psychedelia of Steppenwolf the Second and stepping into the distinctive hard rock of their later releases. The album's cover was designed by art director Gary Burden. The original LP was a gatefold with a punched-out front cover; the punchout revealed a photo of the band which comprised the inner sleeve's recto. This photo of the band was shot by Henry Diltz, and it shows the band sitting in the remnants of amplifiers and equipment in a charred house which had belonged to Canned Heat. (A 1969 fire ripped through Canned Heat's house and rehearsal studio on Lookout Mountain Ave in Laurel Canyon, Los Angeles, California.) Original lead guitarist Michael Monarch did not show up for the photo shoot. Steppenwolf producer Gabriel Mekler bore a physical resemblance to Monarch, and it was decided that Mekler would take Monarch's place in the photo. Mekler was able to hide himself all that more in the photo by sporting a pair of sunglasses. Initially, not too many noticed. Monarch was still, however, in the band. (A dispelled myth is that Monarch was no longer in the band at the time of the photo shoot; he was in the band until the latter part of '69, and the album came out in early '69). The LP was reissued on CD by MCA in late 1980's. MCA decided to not use the photo for their CD re-issue and opted only for the original unfinished war mouse painting, originally intended as the LP's cover. The resulting CD artwork indeed looks bare as a result. The surrounding black-and-white image of the LP's gate-fold sleeve was made by importing images of cartoon mouse heads onto the bodies of soldiers within an image of a U.S. Civil War trenched battlefield. The black-and-white portion of the album art was a collage made by Rick Griffin, who was supposed to paint a final version of what became the album art, but Dunhill Records declined to pay for the painting and so used Griffin's black-and-white prototype. ↑ "Henry Diltz. Music & Musicians Magazine. Web. 2011.